A cam follower, also known as a track follower, is a specialized type of roller or needle bearing designed to follow cam lobe profiles. 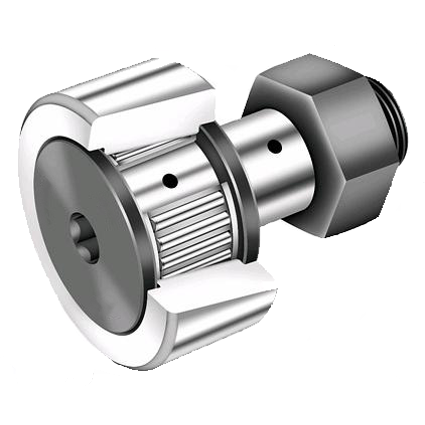 Cam followers come in a vast array of different configurations, however the most defining characteristic is how the cam follower mounts to its mating part; stud style cam followers use a stud while the yoke style has a hole through the middle. The most common type uses needle rollers. This design can withstand high radial loads but no thrust loads. A similar design is the caged needle roller design, which also uses needle rollers, but uses a cage to keep them separated. This design allows for higher speeds but decreases the load capacity. Using a cage design was originated by RBC Bearings in 1971. For heavy-duty applications a roller design can be used. This employs two rows of rollers of larger diameter than used in needle roller cam followers to increase the dynamic load capacity and provide some thrust capabilities. This design can support higher speeds than the full needle roller design.